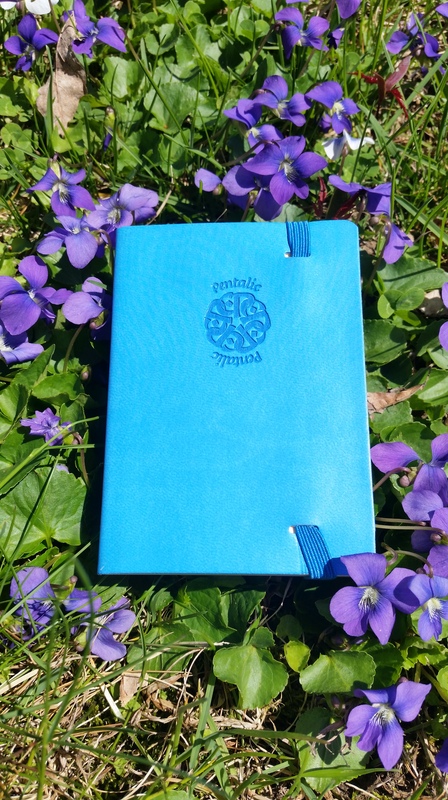 I was able to take a trip to the art shop yesterday and picked up a little sketch book and a pen cloth to keep my zentangles supplies in. 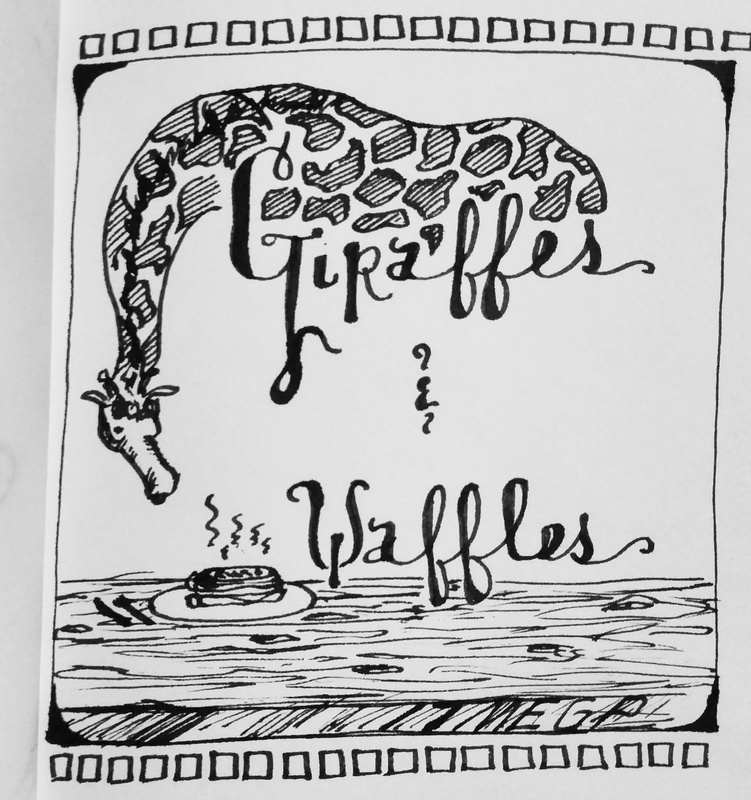 In my newest bible, The Joy of Zentangle, there is a lot of tangles to learn. The authors of the book suggest to have a key ring of cards with all your tangles. This way you can easily flip through them and find the patterns you want. 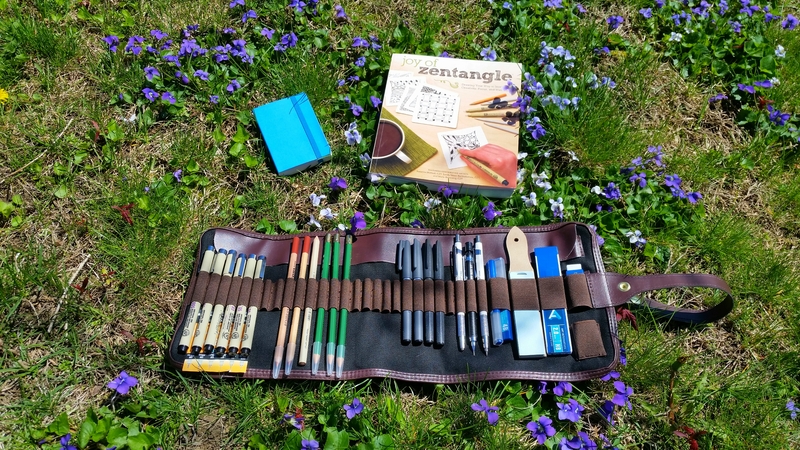 I thought it was a great idea and it would be better than having to lug my book around with me when I draw. I’m approaching it a bit differently and making a “tanglepedia”. The beautiful colors of the hand-sized sketchbooks caught my eye, at the art shop. I decided to go with the blue, one of my favorite colors. I have a few pages done so far and will continue to add to it until it’s completely filled with tangles. Each page has a tangle, the name, and the person who created it. That’s how you make a tanglepedia! As some of you may know I have an obsession with instagram! I check my account daily and surf the photos on there of other artists and friends. I had noticed that many of the artists I follow were posting ink drawings with a related hashtag, Inktober. I became curious…What does Inktober mean? I found out Inktober began in 2009 with Jake Parker. Jake Parker is a cartoonist, animator and illustrator from Utah. As a way to improve his drawing skill, he decided to do an ink drawing everyday through the month of October. Others took notice and soon it became a worldwide practice for artists to share. This year, I joined in and took part in the challenge. I discovered it half way through the month so I only have thirteen sketches for 2016. I will have to wait until next year to attempt the entire month. This challenge was a lot of fun. Besides the fact of practicing my skills, it was also a nice way to mix it up a bit. I was able to draw a lot of things that I have always wanted to and never did. In doing so, I am coming up with more questions on how to achieve better results. This is the next step in becoming a better artist! Also, I studied about many animals I normally wouldn’t have. Thanks for reading this week and I hope you enjoyed the sketches! This month has been quite an adventure! Things are changing rapidly and and new opportunities beginning! Now I know what the hummingbird moth was trying to tell me! I’ve been spinning in circles trying to get everything done. One project I will be finishing this week is a surprise! I don’t want to give away to many details but I was commissioned to do a piece involving seahorses! I have always wanted to do a piece with seahorses and now I finally get a chance to. This one is a painting with some great colors! I’m really excited to “sea” how it will turn out! I am on to my next piece. 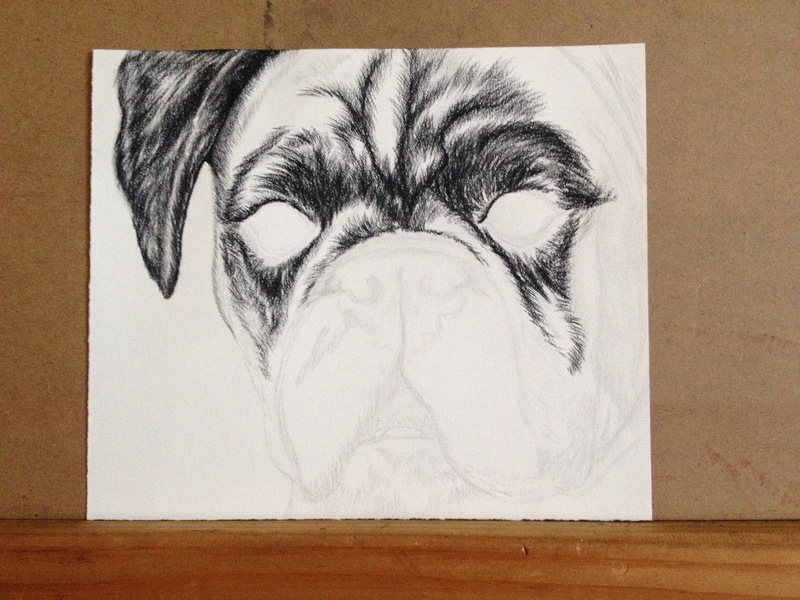 I’m working on another dog portrait to be displayed at a local “Dogcare”. I have four pieces already finished, this will be the fifth. I am a little behind as far as matting and framing them all. These drawings are odd sizes so I have to custom cut all the mats. What a pain! When my son took me to the art shop on Mother’s Day, I bought a new pad of paper that is a standard size. Therefore, I can just get pre-cut mats and make my life much easier from now on! Also, I’ve decided to start streaming as I work on my projects. The site I am using is PicartoTv. If your not familiar with streaming, it’s basically my own online art channel. I’ll work on my projects in front of a camera, live for all to see! While I work I can answer questions and chat with my viewers. I did a trial run last night. I’m still new to the streaming scene, so it will take me some time to learn the ropes. I’m very excited! I do not have a set streaming schedule at this time but for now I will mostly be streaming at night. Once I mess around with it a little more, I’ll do a separate post to go more in depth about my channel. Well, that about wraps up my midweek updates. Hope your enjoying some sunshine where you are! Spring came and then the snow followed! At least where I am! I’m scratching my head confused as to how this happened. Two days ago I was thinking about wearing shorts. Today I have two pairs of pants and three shirts on, struggling to stay warm! Baffling! Well, enough about weather. Let’s talk art! I’ve had a lot going on and don’t have any completed pieces to share this week so I decided to share a WIP (work in progress). 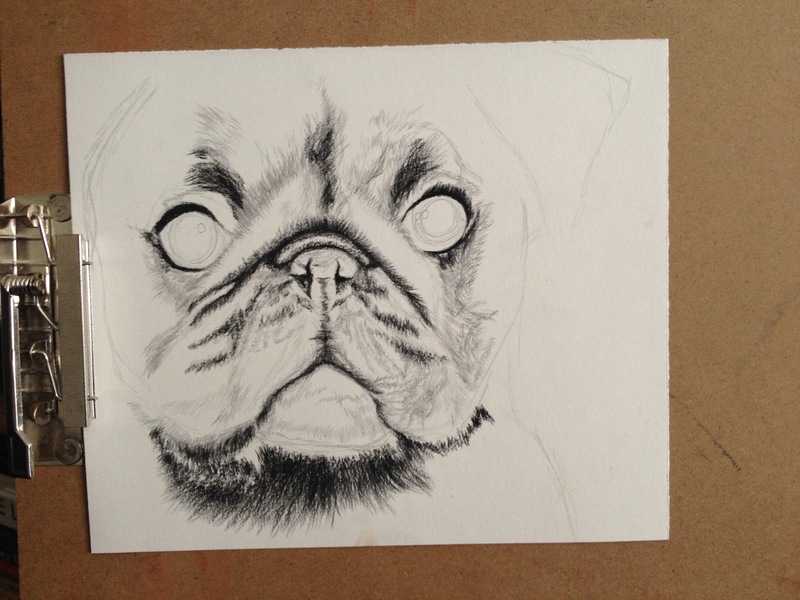 I am working on another dog portrait. By the image you can probably guess the breed. With every wrinkle I add to this image the more it makes me laugh. I am having a lot of fun with this one! I can’t wait to finish it. I also have a few sketches I would like to do. I know too many people who have lost pets recently and I would like to do something in their memory. I have many more ideas but let’s not get to far ahead! If I get too ambitious I’ll get overwhelmed! Stay tuned for my next post featuring my completed piece. I came across a video of an artist, Ruth Oosterman, painting a picture using her toddler’s doodle as her layout. You can check out the video at the bottom of this post. I thought it was a really cool idea. I have a son of my own and I love his drawings and watching him grow as an artist from the very beginning. He loves to draw and paint, so naturally I encourage it. When he was a toddler, and even now, I would give him my sketchbooks so he could doodle in them. While I was sketching the other day, I came to one of the pages he had gotten his crayons on when he was about three years old. I had thought of the video I had watched and wanted to try the same thing that Ruth did. I studied my son’s artwork for a while and starting seeing a waterfall. I began drawing water and the more I added, the more my son’s sketch guided me to the next piece of the scenery. By the end, it became a place I would definitely like to take him. I showed my son the sketch and he gave it his approval. Art is one of our favorite things to share with each other. He likes to grab his “How-to-Draw” books and pick a drawing we can do together. It really got me thinking about how I truly believe we are all born artists. In one way or another we were born to create and explore the depths of our art. Whether it’s drawing, painting, music or even dancing. Art cannot be limited and each of us begins life with a great desire to be creative and make something beautiful. But as Picasso said, the problem is remaining an artist as we grow up. Everyone is so overwhelmed and stressed out nowadays. People are depressed and they don’t know what to do about it. Yet, when we pay more attention to the inner child we all have, we get a little self-encouragement. When we feed our youthful selves and remember what we loved to do as children and incorporate that in our day-to-day, life seems a lot simpler. I read something online the other day and it said, “What would the child you once were think of the adult you have become?” Food for thought. To make a long story short, stay young and fuel your art. Your insides will feel better. How do you let your inner child express themselves? Share a comment or a picture below. Just a sketch for today’s post. Snakes and other reptiles have always fascinated me. 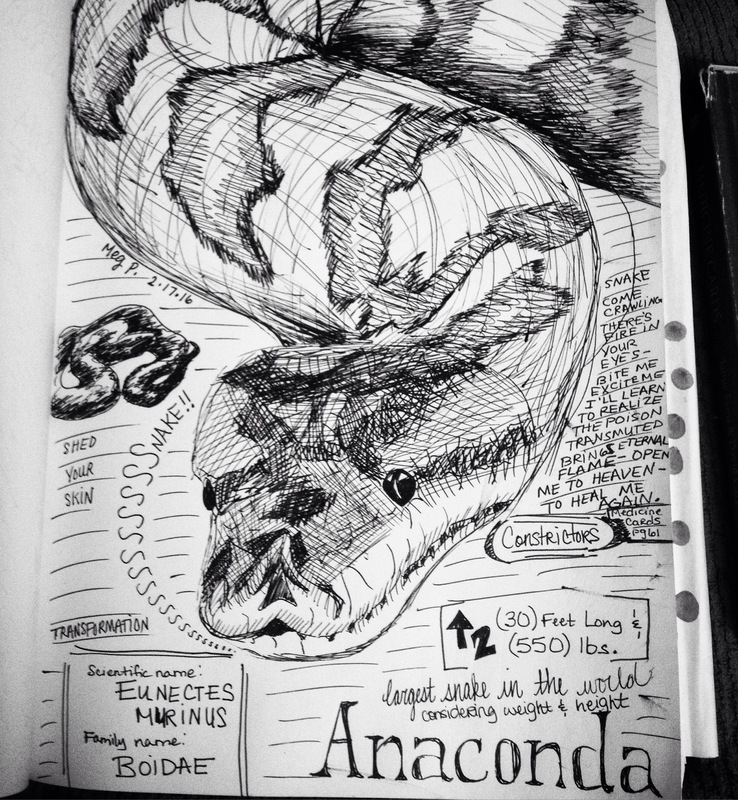 The great anaconda is an earthly wonder! I marvel at their size. The snake in Native American teachings represents transformation. In “shedding your skin” you can tie up loose ends and create room for new beginnings. If a snake slithers across your path, do not fear. New opportunities are near. Do snakes give you the willies? Or do you find them fascinating? There are all kinds; from water snakes to tree snakes, poisonous to constrictors. Which ones do you enjoy or despise? Share a comment below!